I love this time of year! Even when it's crazy busy with work and family events, I can take breaks and squeeze out some time to play in the garden. Elsie and I also potted up all of these little plants this week to use as the favors/centerpiece for Heather's wedding shower that was at my house last weekend. Our friend Ray graciously shared her home and lovely backyard deck area, and six of us took a class with Karen Amelia Brown who was a wealth of knowledge, and very patient with those of us who didn't have a clue what we were doing (eh hem...me). I learned how to make a rainbow! ...And gradations... (I chose blue for my gradation experiment, because one can never have enough "sky" fabric). ...And we did some manipulations ~ folding, twisting, rolling, tying and rubber banding. Every one came out different, and seeing how each piece turned out was the most fun. My friend Mary at Keep Me in Quilts blogged about it Here, if you want to see how her fabrics turned out, (and she caught a photo of me in my messy clothes). 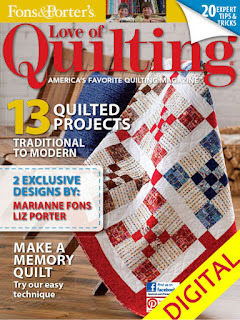 My Cool Blue Quilt is in Fons & Porter's Love of Quilting! 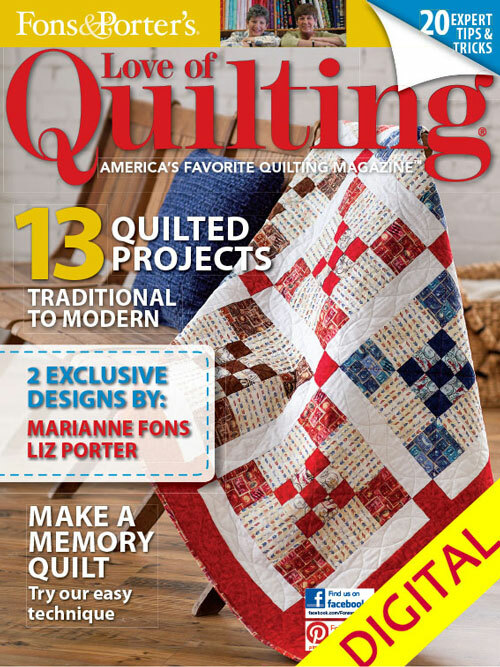 I finally have something to Show & Tell :) This is my "Cool Blue" quilt, and it's in the current issue of Fons & Porter's Love of Quilting magazine! It's a nice wall hanging/table cover size made with the Indigo Blues fabric collection from Fabri-Quilt .